I’m officially nervous. 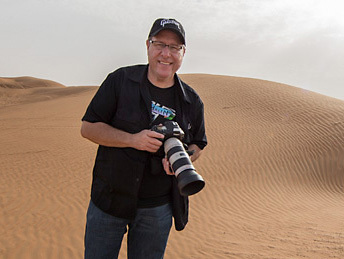 Guest blog for Scott Kelby? Hmmmm. Okay, why be nervous? I’ll just go ahead and pretend I’m writing for my blog. No problem, just type away. But here’s the deal. Scott’s blog is Broadway, man; lights, limos, red carpet, strobes flashing, throngs of swells mingling by the thousands! Scott’s is also a very forward looking blog. Thoughts, notions, products, gear, philosophy, approach… so much of it is about what is happening now, or about to happen, in our industry. It’s pretty cool, and it’s a must read way station for all those trying to stay afloat in the fast moving digital rapids. Scott, in short, is on top of it all. So this is quite an honor, to be sure. It got me to thinking, here in my cave, Mac firmly gripped in my paws, looking for the “on” button, about what got me here. The simple answer is that I’ve been a photographer for 30 years. Lots of jobs, peaks, valleys, nicks, cuts and bruises, bad pictures, some good ones, crazy jobs, lousy hotels, bumpy flights, missed connections, and, like a battered suitcase, I tumbled off the baggage belt, here. …has already been done. In some cases, a long time ago. Touchstones, in a word. I have always revered those photographers who blazed the trail. With none of the tools that are available now, they created an archive that is the shoulders upon which we all stand. Looking at their work is what made me take up a camera. So when things are nuts, and my mind is splintered, and the job seems to be going horribly wrong, and I can’t buy a decent frame, and the camera feels like a dead weight around my neck instead of a means of expression, I go back to this work. It clears my head. It perks me up. It reminds me of what’s possible. It is shelter from the storm. Perhaps the best collection of B&W portraits, ever. Incredible. Tough one to get… Conversations with the Dead, by Magnum shooter Danny Lyon (link) A look at life on the Texas chain gangs. The starkness of his B&W approach is almost as brutal as the life he observes. Robert Capa’s body of work. Shooter, bon vivant, founder of Magnum. No one followed this tenet of good picture making better than Larry Burrows. His Vietnam work is intense and compassionate. His photo story, “The Flight of Yankee Papa 13” is an instructional in telling a story with pictures. Difficult, tempestuous, brilliant. He shot, “Nurse Midwife, Maude Callen,” “Country Doctor,” and “Spanish Village.” How did one shooter make 3 of the greatest photo essays of all time? However, in a book called, Great Photographic Essays from LIFE (tough to find), is perhaps the best photo essay ever done (link). “Working Girl: The Private Life of Gwyned Filling,” shot by the amazing and mostly forgotten Leonard McCombe. The Eye of the Beholder… A compendium of the work of Jim Stanfield, the legendary iron horse of the National Geographic (link). Jim is Superman, as far as I’m concerned. A body of work from one of the quintessential assignment photographers of our time. Few photographers have straddled the worlds of art and photojournalism as effectively. In this book, the color, the heat and the light become the narrative. Serene and powerful, all at once. It was one of the honors of my career to have assisted Gordon for a day. LIFE was re-creating the famous Art Kane jazz photo, A Great Day in Harlem, and Gordon was the shooter. I rounded up my crew, and we gripped for him. Seeing his eye in the lens was not to be forgotten. A font of creativity as a shooter, film maker, author, poet and artist, he never stopped working. He has too many books to his credit to name here. The book is just like John both as a photographer and editor; pointed, intelligent, articulate. Cornell Capa, Robert’s brother, just passed away. He edited a two volume set years ago called “The Concerned Photographer.” (link) It is a wonderful compilation of the work of legendary documentary photographers, such as Werner Bischof, David Seymour, known simply as, “Chim,” Marc Riboud, Bruce Davidson and Donald McCullen. I love McCullen, not just for his work but for what he said. “I only use a camera like I use a toothbrush. It does the job.” Next time you’re swamped with megapixels, and your brain is firing at too many frames per second, and you are trying to remember where a function was in the menu of 200 plus options of the fancy digital machine you just bought, that’s potentially a calming thought. As we race towards the fantastic future, where we will have even more and better tools than we can imagine, it is still important to look back. Pictures last. They have power. They stay, and the important ones, just like big trees, grow roots into our soul. One last book: The Picture History of World War II. A long forgotten book my dad got years ago. I still have it. I remember poring over this book when I was very young. I couldn’t believe such things had happened, and the pictures were the proof. I flipped through it, time and again, so much so, that when I looked at it just now I remembered most of the frames, even some of the layouts. The pictures left their impression on me, even as I turned the pages at the age of 7 or so. I didn’t know it, but I was already becoming a photographer.